I was invited to go along to Lisa Shepherd’s Salon near Oxford Circus for a bit of a hair make-over. 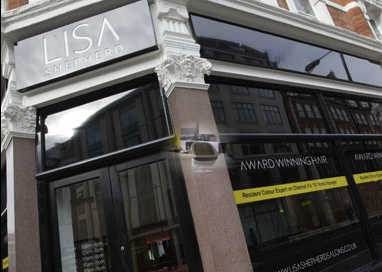 Lisa Shepherd is best known as the resident hairdresser on Channel 4’s 10 Years Younger, but little did I know she also has a selection of salons (in London, Kidderminster, Sutton and Birmingham). I actually chickened out of having a full on hair make-up over (I’m quite happy with the colour and style of my hair at the moment) so just went for a wash/cut/blowdry in the end. I might be alone when I say this, but sometimes a trim and blowdry can be the most daunting of hair services when you are happy with the cut but just need it neatening up. There is the fear there that one fail snip and your previously beloved style turns from lovely mop to mullet and you are faced with weeks of growing out and re-cutting to get back where you want to be. But I’m happy to report that my fears were all for nothing – my hairdresser, Jason (the head honcho at the London branch) did a great ‘shape it up’ cut which was basically a trim – just what I wanted. He listened to what I wanted and talked me through the whole thing, checking about the length of my fringe before taking any extra off and constantly making sure that what he was doing, was what I wanted. I loved how speedy the service was, I was in and out in 45mins – a record time for someone who normally is in the salon for hours with a whole colour/wash/cut/style palava. It was really refreshing just to get my hair trimmed! My only problem now (and this is totally my fault) is that I think I went a bit too tentative on the fringe trim so now have the cut-it-myself or leave it dilemma. 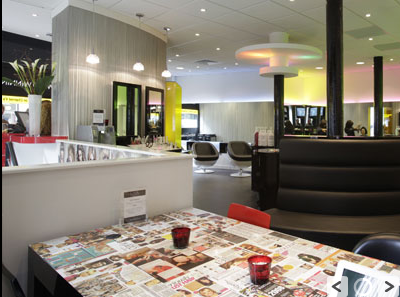 I have to add something about the style of the salon – it’s a very funky place. Hard to miss with it’s bright yellow branding on the outside – mirrored with a bright yellow smeg fridge in the waiting area. When I was led to the waiting area I was told I could help myself to cans of soft drink from the fridge – a really nice touch, rather than the usual squash/coffee offerings. Overall, a very stylish salon with a refreshing approach to hair, the pricing structure is all listed in a really ‘human’ way (ie ‘sunkissed’ rather than ‘half head of highlights’). Plus, new customers to the salon can get a rather lovely 20% off any service. Appointment arranged by PR for review.